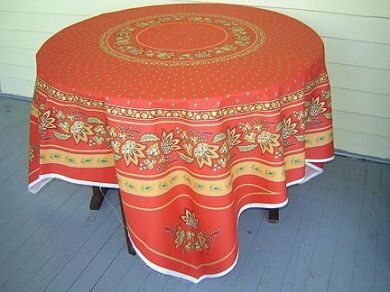 This 70" in diameter unfinished French tablecloth panel can be finished round or square. It is all cotton. The tablecloth panel is printed as a square. Aslo available in finished all cotton tablecloth treated rectangular TCtrLisaRedRect or round treated TCtrLisaRedRD or in various colors including light blue TBtrltBlLisaRect light green TCtrLisaGrRD/TCLisaGrRD white and blue TCtrLisaWtBlRect/TCtrLisaBWRD/TCLisaBWRD blue TBtrLisaBlRect/TCtrLisaBlRD/TCLisaBlRD or yellow TCtrLisaYelRD/TCLisaYelRD or unfinished fabric panel white and blue RDTB171 or blue RDTB30. Coordinating fabrics are available in stripes PR11 and an allover pattern PR12. Placemats QRPM006 and napkins napLisaRd/napLisaBl/napLisaYel are available in our store and will appear online soon.